These Swarovski cufflinks are a geometrical fantasion! This ultra modern design express itself in a simple and minimalistic shape, pattern and ornamentation. 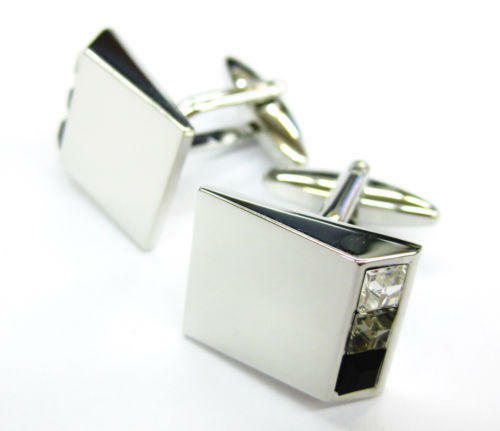 These cufflinks are 3D geometric shaped, coloured in white with a silver fastening. What will definitely appeal to your eyes on this model are three little rhinestones - black one, grey one and luminious or white one - which are situated on the side of the cufflink. Less is more! These cufflinks will excel on black or dark coloured shirt. Trendy cufflinks are an ideal present for men - but also for women! - in opportunity of birthday, Christmas, graduation ceremony or another feast-day. Cufflinks are an accomplished jewellery for wedding days!